Restorative dentists offer their patients a wide variety of crowns, some of which are fabricated in a commercial laboratory, some on an in-office milling machine, and some by an in-house laboratory. In order to provide ideal quality control with the best fit, and aesthetics in the most efficient manner, we have elected to maintain our own in-house laboratory, since 1985. There are several types of crowns that can be placed in a patient’s mouth. They are either fabricated on noble metal, zirconia, or disilicate copings, or they are milled in a laboratory or on a dental office milling machine in a single day. Some of the crowns are tried and proven over many years, some of them are an exciting new technology, and one of them, the in-office milled crown, comes with caution and some very significant concerns. No practice should be using only one type of crown, since there are different indications for choosing one type over another under different circumstances. These crowns are the “granddaddy” of crowns and have been around since the beginning of modern day crown and bridge therapy. 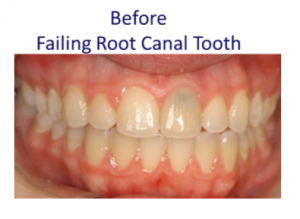 They are the most predictable crowns with the greatest long term results. That being said, they can be more difficult to work with to establish good esthetics than the milled zirconia or the pressed disilicate crowns which have a tooth colored base. They are therefore, more ideal when working with commercial laboratories that are outside of the practice. The better the commercial laboratory, the better the esthetic results that are achieved and visa versa. 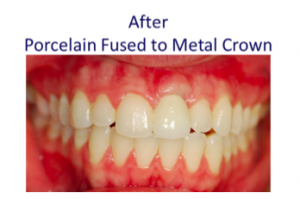 In the best of circumstance, when a practice has an in-house dental laboratory, the crowns are custom fabricated to a patient’s specific characteristics and aesthetics is not an issue. This is a newer technology wherein tooth colored zirconia copings are milled to fit tooth abutments with the crown anatomy also being milled from a library of “typical” teeth in specific locations and according to size and other factors at that location. The shapes are then simulated and altered on a computer monitor. Strengths: easier crowns for the laboratory to fabricate with greater consistency. Weaknesses: crowns fabricated from library of crowns (sometimes altered on a monitor) and are stamped out; crowns are not custom fabricated. If the milling is not accurate, the crown does not fit well. Indications for use: cheaper to produce and, therefore, the crowns have a lower cost. 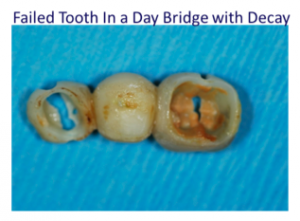 This is the most promising of the newer crown and bridge technologies. It offers tooth colored abutments that are first custom fabricated by the technician using wax patterns, which are then used as patterns to “press” the porcelain to those shapes on the abutment dies (replicas). This provides a tighter fit than the milled copings and crowns. The dentist and the laboratory have the option of customizing the esthetics in the anterior region by pressing the copings and applying the porcelain according to the patient’s personal esthetic requirements. They also provide excellent posterior crowns. Strengths: natural colored, better fitting copings; anatomic form created by the technician rather than a library from a software program. Weaknesses: cannot be used for bridges, at this time. 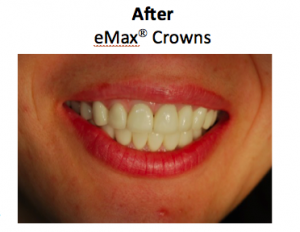 These crowns are marketed as the ultimate solution for the patient because they are all in one day. The patient has the tooth prepared, an intraoral scan is done, and the dentist’s milling machine fabricates the complete crown using a tooth colored ingot. The crown is “stamped out” by a program using preformed crown forms from a library of “usual” crowns for a particular area and size. It is not custom fabricated and is dependent on the accuracy of the milling machine, the drills being used (and how often they are replaced), and other factors. Strengths: for the patient seeking “quick” as the first priority. The patient comes in, has the tooth prepared, scanned, and receives the crown in the same day. Weaknesses: poor fit, since this crown is dependent upon the accuracy of the scan and the milling machine that is in the dental office, which is not as precise as the higher grade milling machines; monochromatic color, since no color can be placed internally by using different porcelains and colors can only be changed by applying surface stains, which is usually performed by dental technicians. In our opinion, the best overall situation for the patient occurs when the dental practice offers both ceramo-metal copings and pressed fit copings, since they both provide the best fit. 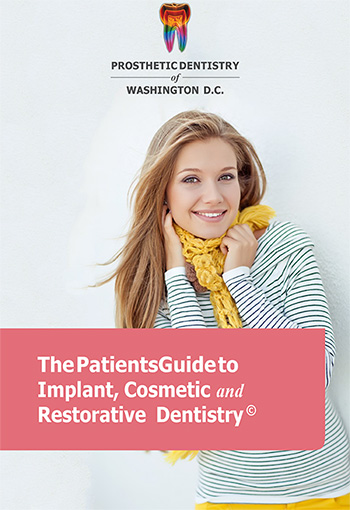 The restorative dentist chooses the right type, depending upon clinical indications. This translates to the best long term prognosis. 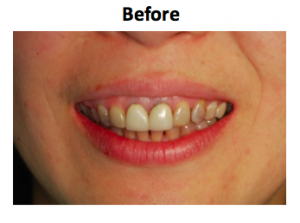 With the right case management, they provide great esthetics, as well.